Did you miss the free class? We had record registration with almost 500 people from all over the world – our biggest training call ever! In the meantime, to be fair, I should let you know about my *exclusive invitation* that I extended. You have a chance to participate in the world’s first Learn Animal Communication In One Weekend- Virtual Retreat coming up soon! It’s a 5 part tele-Course called “Animal Communication System Virtual Retreat”. help them heal AND improve their behavior – even at the beginner ‘but I’m not psychic’ level! Be one of the first 27 Students to Register for either the October or November 2011 Retreat Dates get my Fast Action Bonus! I recently learned a remarkably powerful technique that I’m SO excited to teach you! You can quickly and easily contact anyone, animal, Spirit, Angels, God with a powerful method of accessing information and developing your intuition. I’ve never shared this incredible technique with anyone before. Be one of the first 27 Students who register for either October or November’s Retreat and you’ll get this very special Bonus Training that will help you dramatically develop your skills and that you can use in many ways and for every situation in your life. 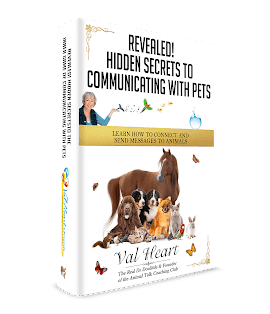 Learning the FastTrack to Communication Training will put you way ahead of the rest of the pack and will make learning animal communication a breeze for you. This isn’t available anywhere else so this is a one time opportunity. I hope to hear you on our first Animal Communication System Virtual Retreat call on October 1st! However… if you’re listening to this recording and are disappointed to have missed the October or November 2011 Retreat dates, not to worry. My intention is to offer the Virtual Retreats periodically, so be sure to check the website to see when the next Retreat dates are.